Bodhidharma (Daruma in Japanese) was the Buddhist monk. He was born in India. And he was the 38th chief monk from Buddha. He moved to China, and he became a founder of ZEN. 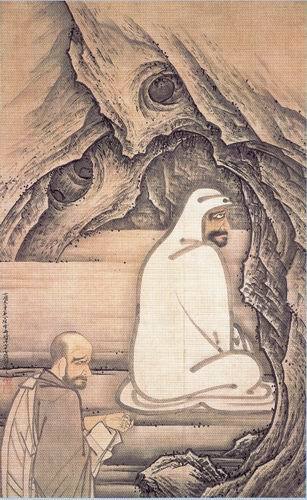 The most famous episode is “Menpeki Kunen (Zazen facing wall for 9 years as covering cloth). He was also founder of ZAZEN (gazing wall/facing wall). “Make yourself be a wall and to see ‘a nothing’ (come to nothing)”. I mean “finding a truth in immovable mind like a wall”. Meditation is different from ZAZEN in a strict sense. Meditation means “close your eyes and image something”. 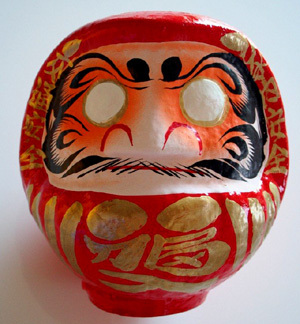 On the other hand, a goal of Zazen is “come to nothing”..
Talking of Daruma, we’re hitting upon Daruma Doll. The doll is emphasizing his style that he’s covering his whole body with a red clothes. That’s why, ancient Japanese had made a Daruma doll (Papier-mache) that emphasized (deformed) Bodhidharma. The birthplace of Daruma doll is Shorin-zan Daruma-ji temple at Takasaki in Japan. This temple was patronized from Tokugawa Mitsukuni (a.k.a. Mito-koumon) in Edo era. In 1783 A.D., Japan had experienced great famine because of the great eruption of Mt. Asama. Then, the 9th chief monk of this temple, Tougaku carved wood Daruma doll to save people around Kouduke (in what is now Gumma). And Tougaku gave instruction to make Daruma doll of paper (papier-mache) which is based on his wood doll, and sell them. Gumma area have dry-weather in winter, so this area is fit to make them. If you have any wish, you paint the iris of right eye with ink. When you reached your goal, or spent a year without accident, you paint the rest (the iris of left eye). Afterwards, you enshrine the Daruma doll wherever you want. And you can get next Daruma doll to grant your wish. 1. The right eye is the first. 2. It’s general that the eye is painted with black ink.